It is my pleasure to forward to you the 2001 Annual Report of the Assembly Standing Committee on Consumer Affairs and Protection. The Committee has been successful in reporting legislation that would significantly increase consumer protection in many areas. Among the measures enacted by the Legislature this year was one that will better protect consumers in the marketplace. The Pre-Need Funeral Consumer Protection Act of 2001 will bring conformity to New York State Funeral Services law by prohibiting any funeral director from receiving compensation for the referral or purchase of a trust or insurance product. This effectively eliminates any financial incentives to steer a consumer to one product over another and thus avoids conflicts of interest. Other measures enacted included preventing odometer fraud, enhancing the loan brokers law, and extending the requirement to have all in-line skates be made with reflective material. In addition, the Committee worked toward the passage of several other measures. These bills, which passed the Assembly, include consumer protection against identity theft, credit card fraud, and price gouging. Following these and other strides made in the area of consumer protection, I am looking forward to a challenging 2002 Legislative Session. The September 11th attacks brought forth emerging consumer issues, and the Committee will work diligently to ensure increased consumer protection and safety for all New Yorkers. I would like to take this opportunity to thank the Committee members for their continued contributions to this past year's achievements. Finally, Mr. Speaker, I commend you for your continued leadership and support of our legislative initiatives to better protect New York State consumers. The Assembly Consumer Affairs and Protection Committee (the "Committee") is responsible for developing legislation aimed at protecting consumers' rights and ensuring the public's ability to make informed choices in the marketplace. Generally, the Committee has jurisdiction over legislation that amends sections of the Agriculture and Markets, General Business, Education, and Personal Property Laws. The broad interests of the Committee reflect the fact that today's consumers can be victims of fraud, misinformation, or lack of information that is vital to their health, safety, and welfare. To protect consumer's rights and help them make informed choices, the Committee works with consumer groups and state and federal agencies. At the State level, these agencies include: the Department of Law, the Consumer Protection Board, the Department of Education, the Department of Environmental Conservation, the Department of Health, the Department of Agriculture and Markets, and the Department of State. The federal government agencies with which the Committee works include: the Federal Trade Commission (FTC), the Food and Drug Administration (FDA), the Federal Communications Commission (FCC), the Consumer Product Safety Commission (CPSC), and the National Highway Traffic Safety Administration (NHTSA). 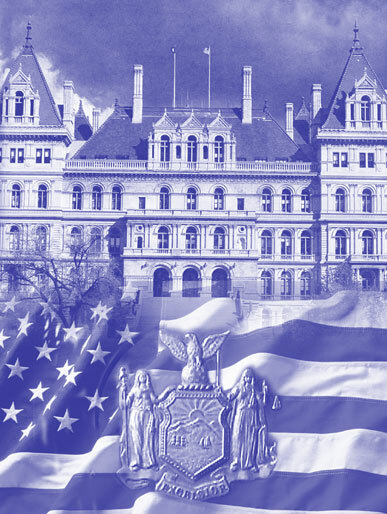 The Committee also works with local agencies, such as the New York City Department of Consumer Affairs, local consumer affairs offices, numerous Better Business Bureaus, and bar associations throughout the State. In addition, the Committee works to help consumers in the development of legislation under the jurisdiction of other Assembly standing committees. Such committees include: Transportation, Corporations, Authorities and Commissions, Economic Development, Job Creation, Commerce and Industry, Agriculture, and Insurance. The Pre-Need Consumer Protection Act of 2001 was formulated to strengthen New York State law regarding funeral and burial arrangements as well as to ensure that New York State consumers are provided with the strongest protections in the nation. This legislation prohibits funeral directors from receiving or being paid a commission for establishing a financial tool such as a trust or insurance policy, thereby eliminating any financial incentives to steer a consumer to one product over another. This law significantly strengthens consumer protection regarding funeral services, which allows consumers to safely rely on New York State's funeral and burial laws to protect them during the period of loss and grief that comes with the death of a loved one. This bill would allow consumers to seek relief from alleged price gougers. It was introduced to help consumers fight price gouging during times of emergency and natural disaster. Price gouging during the 1998 ice storm in the northern part of the State demonstrated the need for this legislation. Five northern counties were in a declared state of emergency, which placed the price gouging statute in effect in those areas. Nonetheless, reports from these northern counties indicate that prices on everything from electrical generators to hotel space increased dramatically in an attempt to take advantage of those suffering from the disaster. At this time, the statute only gives enforcement authority to the Attorney General's office, thereby leaving consumers with a limited recourse against unscrupulous businesses. The Attorney General's office deals with numerous issues and cannot focus on every violation. Private citizens must be able to seek relief on their own from those who seek to profit unjustly from other's misfortunes. This law would permit collateral loan brokers to purchase and sell secondhand property in certain instances. Under current law, collateral loan brokers may not purchase or sell secondhand articles. The underlying rationale is sound as the law guards against the possibility of a consumer being pressured to sell such items. However, an across-the-board restriction on purchases of secondhand property does not serve a legitimate public policy objective. This measure allows loan brokers to purchase and sell items obtained from estate sales or via internet auctions. New York has one of the most restrictive regulatory climates for collateral loan brokers in the United States, and this measure serves to enhance New York State as a site for business, while preserving strong consumer protections. This bill would provide for a thirty day period between the completion of a home improvement and the final payment, in order to allow for a thorough inspection of work done under home improvement contracts. It allows the contractee and contractor to agree that upon entering into an agreement for home repairs and/or improvement, a portion of the payment would be given upon signing the contract, but a final payment would not be given until the consumer had an opportunity to determine whether a job had been done sufficiently. This bill would ensure consumer satisfaction and prevent potential litigation. This bill would apply the same consumer protections that currently exist for purchasers of motorized wheelchairs to non-motorized wheelchairs. It would extend warranty, replacement and quality standards to wheelchairs purchased by State agencies, non-profit medical, dental, health and hospital service corporations, and health maintenance organizations. Wheelchairs and their customized component parts are absolutely essential to the mobility of many persons with disabilities. They are also very expensive, costing as much as $8,000. Much of this equipment is subject to frequent breakdown and is often not covered by warranties or other basic consumer protection. This bill would significantly reduce financial stress for those citizens who rely on wheelchairs to meet their basic transportation needs. This bill would protect consumers from fraudulent practices by computer manufacturers and retailers by prohibiting the industry from selling as "new" computers and computer accessories with old or recycled parts. In 1996, the Packard-Bell Computer Company was caught and convicted of trying to pass off remanufactured and used computer parts as new to consumers. This bill would mandate that the computer industry use only new computer parts when it sells "new" computer hardware, monitors, printers, and other accessories to consumers. It also requires retailers to affix a label or tag on the outside of the container box indicating that only new parts have been used on the computer. The purpose of this bill is to increase consumer protection when purchasing a new house by extending the current implied warranty on new homes for material defects to ten years. Currently, the housing merchant implied warranty provides that six years from the warranty date the home will be free from material defects. The purchase of a new home typically represents the largest single investment that a consumer makes. New home buyers in New York State have had protection of a housing merchant implied warranty since 1989; however, the six year warranty for load bearing portions of the home is insufficient. Extending such warranty to ten years ensures that homeowners are provided protections that realistically reflect consumers expectations when purchasing a new home. This bill would mandate retail sellers of grey merchandise are required to disclose the sale of such merchandise by posting information on two signs. Currently, grey markets merchandise refers to any consumer product normally accompanied by a warranty valid in the United States that is imported into the United States through channels other than the manufacturer's authorized distributer for sale to the public. As a result, the product may not be accompanied by a manufacturer's express written warranty. By adding products distributed through these channels to the definition and by requiring retailers to post two conspicuous signs identifying the merchandise as such, consumers are better protected against deceptive practices. This bill would permit the arbitrator in a dispute over a motorized wheelchair warranty to award reasonable attorney fees and the reasonable and necessary costs of attending an in-person hearing to prevailing consumers. Current law provides that each party has the right to be in attendance at any presentation, but does not provide for reimbursement to disabled consumers of the costs of transportation to a presentation. This bill would permit "one-way" attorney fees in order to ensure that disabled consumers can effectively exercise their rights. This bill would prohibit the advertising or offering of free estimates unless such estimate is in writing and there is no charge for providing such estimate. Unscrupulous merchants sometime offer "free estimates." After providing the offered estimate, the merchant then insists on being paid for a written estimate. This legislation would require that estimates advertised as free are indeed provided at no charge to the customer. This requirement would protect consumers from merchants who might try to employ misleading business practices. This bill would require the labeling of collection bins by for-profit organizations. There are many different organizations that have collection bins in public places to collect clothing or other articles to benefit needy persons. Some of these organizations are for-profit, while others are not. Citizens who wish to donate to these organizations should be able to distinguish which are for-profit and which are non-profit organizations. Certain citizens may not want to donate to organizations that make a profit off of their donations. This law continues the Committee's involvement with in-line skating safety by making changes to the current reflective material guidelines. It requires any skates that are not mandated to contain reflective material to be labelled as such. This measure also extends the implementation date to allow time for industry to develop standards for reflective material on all skates which would not only be utilized on in-line skates sold in New York but that would be utilized on all in-line skates throughout the nation. This bill would prohibit the sale of utility knives or "box cutters" to persons under the age of eighteen. In the past few years, the incidence of assaults on students and teachers in New York State has escalated dramatically. These utility knives are sometimes being used as weapons by students. This legislation would prevent these tools from being misused and brought into schools. In addition, this legislation would allow communities to enact stricter law regarding the sale and regulation of box cutters. This bill would require all sunscreen products to be labelled with an expiration date. According to the American Cancer Society, over 800,000 new skin cancer cases of highly curable basal cell or squamous cell cancers are diagnosed each year. Since 1973, the incidence of skin cancer has increased about 4% per year. Many consumers use sunscreen products to prevent the risk of skin cancer. In light of how important these products are in combating skin cancer, it is important that the consumer be aware that sunscreen is not protective against the sun's rays after a certain shelf life. This legislation would increase consumer awareness of sunscreen products effectiveness by requiring all products to be labeled with an expiration date and storage recommendations. In addition to passing this bill for seven consecutive years, the Assembly also passed a legislative resolution calling on Congress to require the labeling of all sunscreen products with expiration dates at the federal level. The purpose of this bill is to provide consumers with guidance and protection when choosing weight loss services and products. It requires anyone selling or offering for sale weight loss services or products to provide certain disclosures to the consumer. Millions of New Yorkers have tried or are trying to lose weight for medical and cosmetic reasons. It is estimated that dieters across the nation are spending as much as $33 billion each year on diet programs and products. Unfortunately, the results of medical research about the safety and effectiveness of diet programs are often vague and contradictory. This makes it difficult for consumers to decide what programs and products to use. The disclosure of certain weight loss and dieting information will be useful to such a consumer prior to purchasing a product or service. This bill would prohibit the sale of laser pointing devices to persons under eighteen years of age. The Food and Drug Administration (FDA) is warning parents that children may be risking their eyesight if they play with laser pointing devices. The FDA has stated that the light energy that such devices emit can be more damaging than staring directly into the sun. Eye injuries have already been reported to the FDA as a result of improper use of such devices. In addition, this bill would set up restricted access for the sale of these devices in stores. This bill would prohibit the sale of certain articles of children's clothing that have either a large waist or bottom drawstring. The Consumer Product Safety Commission (CPSC) released voluntary guidelines for hood and waist drawstrings. It recommended that manufacturers and retailers provide outerwear with alternative hood and neck closures like snaps and buttons. The recommendations were made after the CPSC received reports of 17 deaths and 42 injuries to children associated with clothing with drawstrings. This bill would prohibit drawstrings on all size 2T to 12 clothing and overlay long waist and bottom drawstrings on size 2T to 16 clothing. In doing so, this measure would help in protecting children from potential injury. The purpose of this legislation is to protect potential car buyers from unscrupulous car sellers who misrepresent the mileage of a vehicle for sale by creating a civil fine to deter such behavior. With the popularity of consumers' leasing rather than the purchase of new vehicles, there has been an increase in the amount of reported incidents of vehicle odometer rollbacks. This is partly due to unscrupulous dealers trying to sell high mileage vehicles returned at the end of their lease contracts. Current law states that a used car dealer must actually transfer a vehicle with the rolled-back odometer for a crime to be committed. Essentially, the dealer is able to present the vehicle with erroneous mileage to customers without violating current law. This legislation establishes new fines for knowingly and willfully altering or misrepresenting the mileage of a vehicle to a customer. This bill would require rental vehicle companies to furnish every customer with an owner's manual or diagram describing the operation of the vehicle. Failure to provide the required manual would result in a fine against the rental company. Currently, there are no requirements that a rental vehicle be equipped with operational manuals. Therefore, renters are forced to guess the location and operation of the vehicle's mechanisms, which could create safety problems. By mandating that rental companies provide all the necessary car manuals to the consumer prior to renting the vehicle, consumer safety associated with the operation of such vehicle would be increased. This legislation would provide consumers with important information regarding child safety seats and their proper use for maximum safety. The National Highway Traffic and Safety Administration (NHTSA) estimated that a properly used child car seat reduces the risk of fatality by 71% and the risk of serious injury by 67% for children of less than 5 years of age. This legislation would require the disclosure of the compatibility of the seat with the automobile and require the age limit of the child safety seat to be properly labeled. This measure would serve to help consumers, especially parents, in selecting a safe, compatible car seat for their loved one. The Committee has taken great strides in promoting legislation that would protect the privacy of New York State's consumers. Unfortunately, the Senate failed to act on most of these bills. A serious misuse of personal information has come to the forefront of the Committee's attention: the theft of identity. While this crime is becoming more widespread, there are very few laws enacted that protect consumers from this crime. This bill would define the crime of identity theft so it is clear that the individual whose identity is misused is a victim of the crime as well as any entities, such as banks, who are defrauded by the identity theft. It creates three classes of theft of identity crimes and would permit the Attorney General to seek injunctive relief. This provision would create deterrents to the crime of identity theft. This measure would increase security for credit and debit card transactions by prohibiting businesses from printing more than the last five numbers of a credit or debit card number on a receipt. Each year an estimated 2 billion dollars nationwide is lost due to credit and debit card fraud. As credit and debit card sales volume increases, so does the likelihood for fraud. Such fraud can be perpetrated by utilizing information printed on transaction forms. This bill would help prevent fraud by limiting the amount of information printed on transaction receipts. The purpose of this bill is to prohibit credit card companies from imposing a fee on only those customers who choose not to carry a monthly balance. Paying off the monthly balance on a credit card is something many people strive for and a great accomplishment. Imposing a fee on such conscientious credit card holders to offset the losses incurred by other card holders is an unjust business practice. This bill would require credit card issuers to establish a procedure whereby cards may be activated only after the holder contacts the card provider and provides proof of identity. This legislation would also prohibit pre-approved credit card applications that indicate on the exterior of the envelope that enclosed materials are pre-approved. Credit card fraud continues to be a pervasive problem for both consumers and the financial industry. This bill would make several fraud prevention devices available to consumers, such as card activation programs and the prohibition of labeling "pre-approved credit" on envelopes. These preventative measure would provide consumers and merchants with extra security in an increasingly technological era and aid in combatting credit card fraud. This bill would prohibit a merchant from writing or attaching a consumer's address or telephone number on a credit card transaction form. In 1989, the legislature enacted a credit card privacy law that prohibits merchants from requiring customers to put their name and address on a credit card transaction form. A number of merchants are circumventing the law by taking the customer's name and address on a separate piece of paper and attaching it to a credit card form. This legislation would ensure that personal identifying information on credit card forms or attached paper falls under the protection of the 1989 law. This legislation would reinforce the principles of confidentiality and promote greater accuracy and security in the credit reporting industry by conforming state law to various provisions of the Federal Fair Credit Reporting Act. Credit reporting agencies have developed new information sorting and reporting capabilities that enable them to exchange data and sell biographical and demographic information in these files. In such cases, personal information now freely flows from a regulated environment (consumer reporting agencies) to non-regulated environments (target marketing, commercial credit reporting). With these practices, it is difficult, if not impossible, to verify whether the data are being utilized for valid or permissible purposes. This bill will reform the law, balancing the needs and the interests of the industry and the rights of the consumer. This bill would help protect personal privacy and reduce the threat of identity fraud by providing consumers an avenue to exercise their preference not to receive additional unsolicited advertisements and restrict the release of their personal information. By requiring senders of unsolicited advertisements to provide a written disclosure notifying consumers of their right not to receive further unsolicited advertisements, consumers have the choice if they wish to receive advertisements. This legislation would prohibit the sale or lease of consumers' electronic mail address without consent. Current law does not address the sale or lease of electronic mail address or other personal identifying information obtained from consumers while on line. A 1996 Equifax/Harris Consumer Privacy Survey on internet practices confirmed that internet users overwhelmingly objected to the tracking of their web browsing activities for marketing purposes. This bill would protect the privacy rights of consumers on the internet. This measure would regulate the transmission of unsolicited electronic mail advertisements by requiring that certain identifiable information accompany such advertisements. While the transmission of unsolicited facsimile transmissions is prohibited by law, the transmission of unsolicited electronic mail (E-mail) advertising currently is not. This type of advertising (known as "junk E-mail" or "SPAM") can be costly to the recipient. This bill provides consumers with a means of alerting the sender that they do not want any further transmissions of these unwanted and unsolicited electronic mail advertisements. Those who find such communications valuable need do nothing and they will continue to receive E-mail advertisements. This bill would establish the first enforceable Internet Privacy Law in the United States by setting up voluntary guidelines for a web-site seal of approval program for entities conducting business in New York State. Survey reports claim that the lack of privacy has inhibited potential customers from engaging in on-line shopping. By voluntarily complying with this program, businesses would subject themselves to New York State's jurisdiction. This bill would benefit consumers and web businesses by providing enforceable privacy standards to the internet. This legislation would protect the privacy of confidential personal information by enabling consumers to prevent information brokers from disclosing such information to certain third parties. It would allow New York residents to place their names on an "exclusion list" maintained by the Secretary of State to advise an information broker directly that they want their confidential information protected. Advances in information technology have facilitated the compilation, sophisticated analysis, and wide dissemination of massive amounts of data, at ever decreasing costs, and this has enabled many entities to gain access to private, personally identifiable information without the knowledge and consent of the person to whom the information relates. This bill seeks to address these problems by imposing restrictions on the ability of information brokers to disseminate personal information about individuals. In February, a concern was raised regarding the "sell-by" dates placed on meat in many food stores. In order to investigate the issue, the Committee held a roundtable in Albany to discuss current state and industry procedures regarding the sale of fresh meat, poultry, and seafood in New York State. The Department of Agriculture and Markets, the Food Industry Alliance, and Price Chopper food chain participated, as did many concerned Members of the Assembly. The panel found that "sell-by" dates located on perishable meat products are a voluntary industry standard, which is used as a tool in rotating and ensuring the freshness of the product. In addition, the Department of Agriculture and Markets has standards of freshness that every store must abide by. Unfortunately, many customers perceive the sell-by date as the last date a product should be sold. The Committee is concerned with the perception of the "sell by" date and is committed to ensuring that consumers receive accurate information. The Committee is pursuing legislation that would promote consumer education and awareness. On October 18th, the Committee held a joint hearing with the Standing Committee on Codes and the Task Force on Food, Farm, and Nutrition to investigate the adequacy of government regulation of the safety, effectiveness, labeling, and health claims of dietary supplements. Federal law defines dietary supplements as any product taken by mouth intended to supplement the diet with ingredients such as vitamins, minerals, herbs, metabolites, and amino acids. Currently, 40% of Americans use dietary supplements, which generate $12 billion in annual sales in the U.S. The 1994 Dietary Supplement and Health Education Act (DSHEA) allows the sale of supplements without pre-market reviews and permits health claims on labels with 30 day notice to the FDA. Under DSHEA, the FDA monitors the dangers of supplements through its adverse event reporting system and can take enforcement action to restrict or remove a product if it is found to create a "significant risk." Unfortunately, the FDA reports that less than one percent of all adverse events are reported. Recently, there has been increasing interest in regulating unsolicited e-mail and advertisements. Such advertisements can be burdensome to both business and consumers, adding cost to internet access and services. Currently, sixteen states have enacted legislation regulating unsolicited e-mail. The Committee co-hosted a roundtable with the Assembly Commission on Science and Technology to discuss potential regulation of unsolicited e-mail. Among the participants were the office of the Attorney General, New York City Department of Consumer Affairs, AOL TimeWarner, DoubleClick, and other consumer and business groups. The roundtable marked a successful dialogue on this topic. Issues included the viability of different enforcement methods and rights of action for the consumer. The Committee plans to introduce legislation in the 2002 session and to continue the dialogue with consumer and business advocates. The Committee will pursue many of the issues it addressed during the 2001 Session. A primary concern will continue to be enhancing consumer rights and protection, especially in the aftermath of an emergency, such as the attacks on the World Trade Center. In addition, the Committee remains committed to enacting legislation to further protect consumers by preventing identity theft, enhancing food safety and automobile leasing protections. A.174-A Markey This bill would prohibit the sale of box cutters to persons under the age of eighteen. A.287 Tokasz This bill would prohibit the sale of laser pointers to persons under the age of eighteen. A.366-A Kaufman This bill would mandate that information required to be disclosed by retail dealers of grey merchandise be disclosed on two signs. A.368 Kaufman This bill would permit the award of reasonable transportation and other costs to consumers for attending any presentation made by another party at an alternate arbitration procedure for motorized wheelchair warranty disputes. A.820 Cook This bill would require that persons selling weight loss services provide consumers with a weight loss and dieting notice. A.1290 Greene This bill would prohibit any person from advertising or offering to provide free estimates for any repairs or services unless the estimate is provided in writing. A.1854 Dinowitz This bill would prohibit the retail sale of certain articles of children's clothing that have drawstrings. A.1870 Lentol This bill would prohibit the issuer of a credit card from imposing a finance charge or fee upon a card holder who elects not to carry a credit balance or a minimum credit from one billing cycle to the next. A.1988 Weisenberg This bill would require sunscreen products to be labeled with expiration dates and storage recommendations. A.2494 Lafayette This bill would require rental car companies to furnish to every customer an owner's manual or diagram describing the operation of the functional devices within the vehicle. A.4110 Pheffer This bill would create a private right of action for unlawful price gouging. A.4111 Pheffer This bill would provide for certain labeling requirements on child safety seats. A.4233 Greene This bill would prohibit any person from offering for sale tangible or intangible goods or services that have not been actually ordered or requested by the recipient. A.4939-B Pheffer This bill would prohibit and penalize identity theft and similar acts. A.5895 Sanders This bill would extend motorized wheelchair warranty requirements to all wheelchairs. A.6741 Levy This bill would require the labeling of clothing collection bins placed by for-profit organizations. A.8453-A Matusow This bill would prohibit businesses from printing charge, credit, or debit card numbers on receipts that are electronically created.